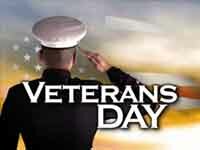 Westwood One Airs Veterans Day Series | Broadcast Public Service: Local Stations. Big Impact. Westwood One News produced an 11-part original series for Veterans Day. Features included: an Iraq and Afghanistan veteran, now in college, discussing differences between military and student life; a West Point graduate sharing what he learned from leading soldiers during two tours in Iraq; a website encouraging people to volunteer on Veterans Day; a female Marine addressing women-specific military issues; Rep. Martha McSally (R-Ariz.), a retired Air Force attack pilot and squadron commander, talking about challenges with dealing with the Department of Veterans Affairs; a former Army officer providing examples of how World War II veterans re-entered civilian life; an American Legion post manager explaining the benefits of joining veterans’ groups; and a consultant who helps companies hire servicemen and women addressing the veteran employment picture.